It’s been a while since I shared my monthly favorites, but there were so many standouts in July & August that I felt like I would be doing you all a disservice if I kept them to myself. A couple of these are re-discoveries, meaning that I used them in the past – even years ago! – and just forgot how good they are. Peter Thomas Roth Max Complexion Correction Pads* ($40) – This is one of the newest products in my collection, but I already dedicated a permanent spot for it in the beauty cabinet. It contains the maximum topical OTC concentration of Salicylic Acid that targets breakouts, and 10% Glycolic Acid that brightens skin discolorations and helps with uneven texture. The pads jumpstarted my skin’s recovery big time, so now I use one every day or every other day, and my complexion is gradually starting to look better. I wish they were fragrance-free though. Peter Thomas Roth Potent-C Power Serum* ($95) – I featured this serum on IG a few times, and it’s still one of my favorite products from the brand. The formula contains everything I would look for in an anti-aging day serum: the holy trifecta of stable Vitamin C, Vitamin E, and Ferulic Acid in concentrations high enough to be both a potent antioxidant blend and provide brightening benefits. The formula is fragrance-free! P.S. : I don’t know if you can tell, but I really like PTR skincare. I even got my husband hooked on their cleanser so now it’s the only one he wants me to buy for him. SKIN&LAB Red Serum ($35) – This product is a re-discovery; I used it way back when I first started getting into k-beauty. It is actually a cult product in Korea! The formula contains some really nice plant extracts, and Niacinamide + Adenosine complex to gently brighten the skin and nourish the lipid barrier. To me the best part about this serum is how gentle it is. It doesn’t brighten as quickly as the PTR serum above, but it gets the job done at its own pace and makes the skin gradually look brighter and more supple without pushing the envelope on potential sensitivities. So if you’re not in a rush and just want a brightening serum that is gentle and effective, I think you’ll really like this one. This serum is fragrance-free, too, which is always a bonus. Fresh Black Tea Firming Overnight Mask* ($92) – I bet by now you’ve heard enough people raving about the new tea/kombucha products from Fresh. I am still undecided about the rest, but I used this overnight mask enough to determine that I like it a lot. It has the consistency of a thick, whipped paste, so it may be too heavy for people with really oily skin. It was just perfect for my combo complexion though. This mask sort of envelops the skin and prevents the moisture from evaporating overnight. I wake up slightly glistening, but my face looks really fresh and supple after I wash everything off. The formula does contain added fragrance, even though it’s very mild. Elemis Peptide4 Recovery Eye Cream* ($49) – Elemis is another brand that I talk about all the time, but until recently their products were a bit difficult to find in the states. Well, they’re now available at Ulta! This eye cream is one of the brand’s latest releases, and it’s meant to complement other products in the Peptide4 lineup. With some beauty products it’s pretty obvious what the benefits are supposed to be, but with Peptide4 it’s a bit trickier. You probably heard that the skin regeneration improves at nighttime, usually between 10pm and 3am. It happens because humans are wired to sleep at night, so our bodies adapted to be in rest mode during that time. Skin is no different, as it is also an organ. Peptide4 line contains ingredients designed using advanced molecular biology to help your skin use its natural circadian rhythm more effectively. Basically, I feel like my skin bounces back better overnight when I use products from this line, so I wake up looking more rested. The formula is fragrance-free! Algenist POWER Recharging Night Pressed Serum* ($90) – And here we have another overnight cream; can you tell I’ve been experimenting with my PM routine? Algenist is a toss up for me personally, I liked about half of the products from the brand that I had the chance to try. My mom on the other hand is a die hard fan and loves everything they make. Not surprising, after all Algenist is mostly marketing to women with mature skin and advanced signs of aging. With that said, this solid serum works wonders for my mid 30s skin. The texture is more like a lightweight moisturizer, so it nourishes the skin overnight but also doesn’t feel too heavy. It pretty much gives me the same results as Fresh Black Tea mask I mentioned earlier, but without the glistening skin in the morning. The formula contains fragrance, but I find it to be very pleasant and soothing. COOLA Organic SPF 30 Full Spectrum 360° Sun Silk Drops* ($46) – A good sunscreen is a non-negotiable step in my AM beauty routine, and right now I am using these liquid drops from Coola. I actually really like the runny consistency, because it makes the sunscreen easier to spread to make sure every corner of my face, neck, and chest is covered. I like these drops in particular because they eventually absorb into the skin and don’t make my face look greasy. And of course I appreciate the cleaner formula that excludes some potential skin irritants – organic ingredients always get thumbs up from me. Mount Lai Jade Roller ($34) – I actually pre-ordered this roller from Stephanie after reading this post on her blog, and it exceeded all of my expectations. This is not my first jade roller, but quality of the ones I used before was not that great. They either weren’t polished sufficiently so it took too much effort to make the roller actually roll, or they were making squeaky sounds during the use. Last one I had completely broke apart! I use the roller AM and PM to improve the circulation, and I think it does help. Plus, the cooling sensation from a cold stone is very relaxing. 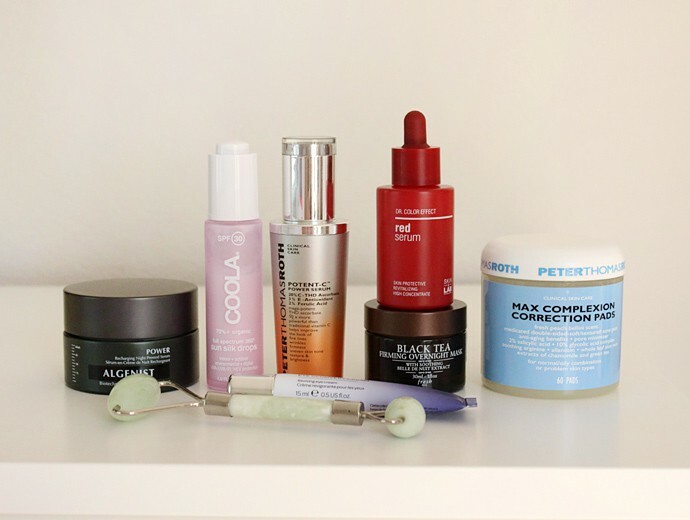 As good as they are individually, I didn’t actually use all of these products in a single routine. I’m still working on taming my skin so there won’t be a routine post for a while, or at least until I get everything sorted out. 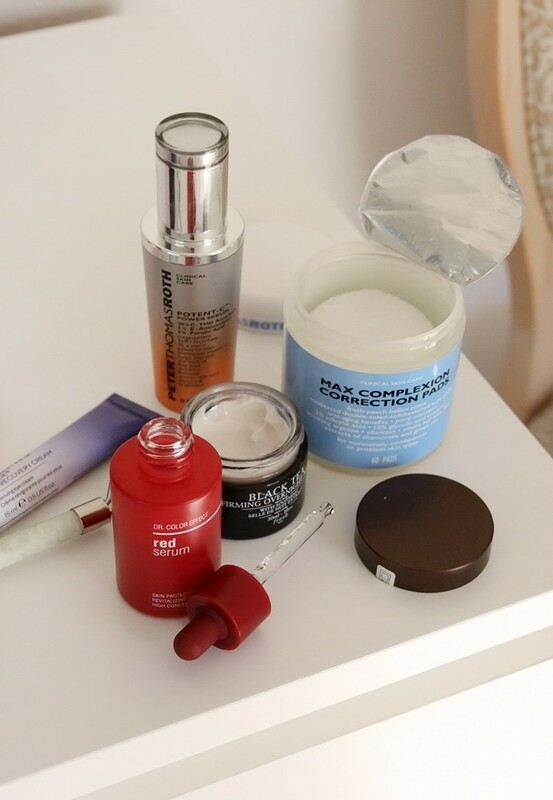 But as soon as I get my skin under control, I’ll be sure to share how I got there and what I am using. Cheers! What are some of your personal summer beauty standouts? Did you discover any outstanding products? Feel free to share in the comments! This post features products received for editorial consideration and may contain affiliate or referral links. For more details about my product review policy, copyright, and information about affiliate links, please refer to Disclosures & Content Use page.